There is a dangerous misconception coloring the digital security debate in the Federal government. During the last week, in the wake of the breach at the Office of Personnel Management (OPM), I have been discussing countermeasures with many parties. Concerned officials, staffers, and media have asked me about the Einstein and Continuous Diagnostic Monitoring (CDM) programs. It has become abundantly clear to me that there is a fundamental misunderstanding about the nature of CDM. This post seeks to remedy that problem. The main system used by the federal government to protect sensitive data from hacks has been plagued by delays and criticism that it is already outdated — months before it is even fully implemented. Collect results from departments and agencies. The CDM program enables government entities to expand their continuous diagnostic capabilities by increasing their network sensor capacity, automating sensor collections, and prioritizing risk alerts. CDM offers commercial off-the-shelf (COTS) tools, with robust terms for technical modernization as threats change. First, agency-installed sensors perform an automated search for known cyber flaws. Results feed into a local dashboard that produces customized reports, alerting network managers to their worst and most critical cyber risks based on standardized and weighted risk scores. Prioritized alerts enable agencies to efficiently allocate resources based on the severity of the risk. Progress reports track results, which can be used to compare security posture among department/agency networks. Summary information can feed into an enterprise-level dashboard to inform and situational awareness into cybersecurity risk posture across the federal government. The "situational awareness" here means configuration and patch status, not intrusion status. As you can see, CDM is about managing infrastructure, not detecting and responding to intruders. 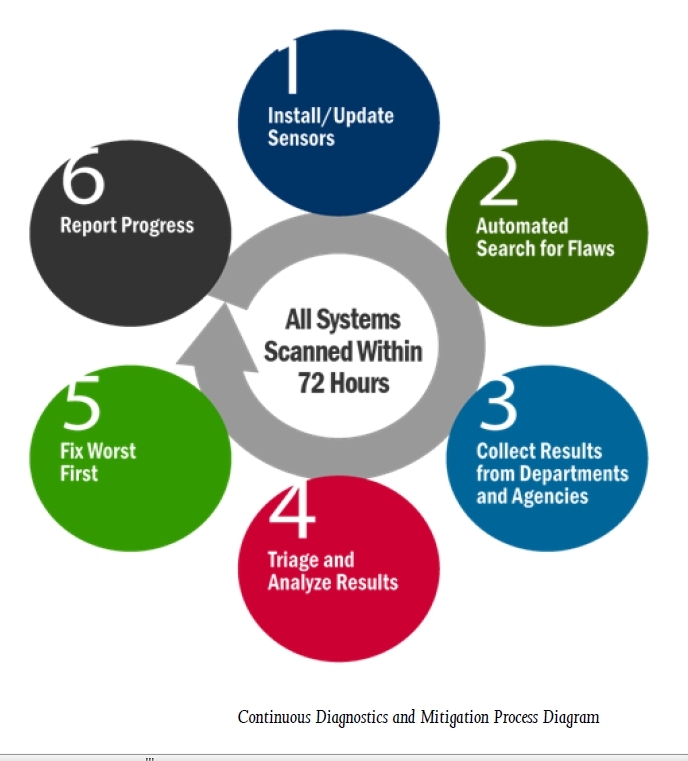 Don't be fooled by the "monitoring" in the term CDM; "monitoring" here means looking for flaws. In contrast, Einstein is an intrusion detection and prevention platform. It is a network-based system that uses threat signatures to identify indications of compromise observable in network traffic. Einstein 1 and 2 were more like traditional IDS technologies, while Einstein 3 and 3 accelerated are more like IDP technologies. Furthermore, I'm not saying that CDM is a bad approach. All of the CDM phases are needed. I understand that intruders are going to have an easy time getting back into a poorly secured network. My goal with this post is to show that CDM is either being sold as, or misunderstood as, a way to detect intruders. CDM is not an intrusion detection program; CDM is a vulnerability management program, a method to Find and Fix Flaws Faster. CDM should have been called "F^4, F4, or 4F" to capture this strategic approach. The focus on CDM has meant intruders already present in Federal networks are left to steal and fortify their positions, while scarce IT resources are devoted to patching. The Feds are identifying and locking doors and windows while intruders are inside the house. It's time for a new (yet ideologically very old) strategy: find the intruders in the network, remove them, and then conduct counter-intrusion campaigns to stop them from accomplishing their mission when they inevitably return. CDM is the real "multibillion-dollar boondoggle that is diverting attention away from the security overhaul that is needed." The OPM breach is only the latest consequence of the misguided CDM-centric strategy. What if the CDM "find" is backed by red-teaming analysis geared around MITRE ATT&CK and Cyber Analytics Repo (CAR) research, such as TTPs that active adversaries (especially APT and criminal actors) are using? I.e., What if it's Adversary Emulation that drives CDM's Automated Search? From a model perspective, ATT&CK; for the framework, CAR / CARET -- https://car.mitre.org/caret/; and for the platform: either Cobalt Strike Malleable C2 and/or PowerShellEmpire Communication Profiles -- https://bluescreenofjeff.com/2017-03-01-how-to-make-communication-profiles-for-empire/ -- ? Wasn't this the foundation for programs such as the Fort Meade eXperiment (FMX) -- https://www.mitre.org/careers/working-at-mitre/employee-voices/a-cyber-security-engineer-scores-a-big-win-with-attck -- ? I would say that CDM holds up given this set of inputs, subject of course, to other measured criteria. One of the criteria that I would add to ATT&CK and CAR / CARET would be characterization of initial-entry points, whether by social engineering (e.g., cred theft via unintentional insider), trusted insider, and/or exploitation (e.g., by CVE and/or attack vector, i.e., http://tecapi.com ). CARET, in particular, seems to be focused on access-expansion techniques, but not initial-entry points.